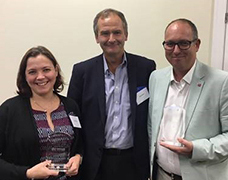 Congratulations to Neil Clements, Yvonne Francis and Haemochromatosis UK, who have won the inaugural Patient Safety Learning/AvMA award for “engaging patients and their families in safety improvement initiatives”. The award recognises and rewards healthcare workers for making patient safety improvements, working effectively with families and improving culture to better support patient safety learning. The winning project was a collaboration between Neil, a haemochromatosis patient; Yvonne, a haematology clinical nurse specialist from Guy’s and St Thomas’s NHS Foundation Trust; and Haemochromatosis UK. It won the award for “defining and promoting venesection best practice”. AvMA chief executive and member of the judging panel, Peter Walsh, said: “The judges were particularly impressed by this initiative because of how it emanated from real patient experience and was patient-led resulting in a powerful collaboration between the patient, the NHS trust, a national charity, and is bringing about demonstrable patient safety improvement”.